The Fourth Global Congress on Intellectual Property and the Public Interest took place on December 15-17, 2015 at National Law University, Delhi, India. 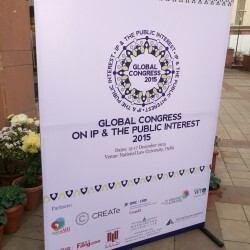 The Global Congress was co-hosted by The Centre for Internet& Society, National Law University Delhi, Open African Innovation Research, CREATe, The American Assembly, Columbia University and American University. And it was co-sponsored by OSF, IDRC, Fang.com and Centre for WTO Studies. The theme for the 2015 Congress is “Three Decades of Openness; Two Decades of TRIPS”, which juxtaposed the beginnings of an aspect of a culture of Openness with that of the establishment of minimum standards of intellectual property protection and the carving of limitations and exceptions within these standards. The2015 Congress opened with Plenary Sessions featuring keynote addresses delivered by persons of eminence across disciplines, before having participants break out into theme-specific rooms for presentations, workshops and panel discussions. The keynote speakers were Professor Ranbir Singh, Vice Chancellor of the National Law University (NLU) in Delhi, where the conference was taking place. This was followed by Keynotes from eminent scholars, activists and negotiators – Mr. Sean Flynn (US), Prof. Michael Geist (Canada), Mr. Zakir Thomas (India), Prof. Hong Xue (China Beijing Normal University IIPL Director), Mr. G.R. Raghavender (India) and Prof. Nagla Rizk (Egypt), who all set the scene from the historic to the contemporary context. 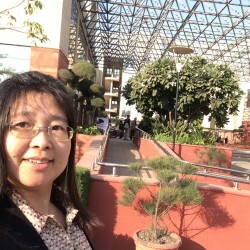 Prof. Xue presented on “Rethinking Internet Intermediaries in the International eTrade”, in which she eloquently pointed out that the emerging pervasive cross-border e-commerce has brought up the salient challenges to the current international intellectual property regime, especially customs measures for intellectual property enforcement for international goods trade. The aggregation effect of the traditional de minimis in the international e-trade threatens the customs enforcement that is only suitable for large scale commercial consignments. The blurring line between B2B and B2C in the cross-border e-commerce calls for new information access, enforcement measures and assistance from the critical stakeholders, i.e. Internet Intermediaries or platform services. Prof. Xue emphasized that a 3rd dimension (on platform governance) be recognized and reviewed in the law to enable an updated, effective and balanced IP enforcement for the globalized eTrade. Prof. Xue’s presentation was warmly hailed as one of the most impressive and thoughtful researches unveiled at the 2015 Global Congress. After the focused keynote speakers and plenary sessions, the 2015 Global Congress carried out discussions through 4 parallel “tracks”, in the fields of “Openness”, “Access to Medicines”, “User Rights”, and “IP & Development”. The Global Congress began in Washington DC in 2011, moved to Rio de Janeiro in 2012, and was held in Cape Town in 2013. This year’s Congress featured an additional “Room of Scholars”. “The Room of Scholars” had been conceptualized as that cross­cutting space, not restricted to a particular track but as running along side them. The “Room of Scholars” became an opportunity for the presentation of longer, more detailed academic research papers on the theme of the Congress. The Global Congress on Intellectual Property and the Public Interest has become the most significant event on the calendar for scholars and policy advocates working on intellectual property from a public interest perspective. The Global Congress supports the formation of strong networks and the dissemination of research and strategies among academics and practitioners, with the aim of empowering them to respond to law reform and enforcement proposals that threaten access and innovation, and to put forward a positive agenda for policy reform. Specifically, the 2015 Congress sought to produce three outcomes- first, the mobilization of existing scholarly research directly into the hands of civil society advocates, business leaders and policy makers, leading to evidence-based policies and practices; second, the collaborative identification of urgent, global and local research priorities and generation of a joint research/advocacy agenda; and third, the solidification of an inter-disciplinary, cross-sector and global networked community of experts and practitioners focused on public interest aspects of IP policy and practice. The event attended by over 400 scholars, advocates, policy-makers and practitioners, was the biggest global gathering of public interest folk specialized in intellectual property issues in 2015. The 2015 Congress is expected to achieve all three goals it set for itself.